My mom has been hounding me to take vitamins. Vitamin D in particular. Family genetics seem to indicate that taking a Vitamin D supplement would be a good idea. That plus the fact that I spend 90% of my time indoors. I’ve been taking an iron supplement for my anemia (which is getting much better, thanks for asking). Then, because iron can block calcium absorption, my doctor suggested I also start taking a calcium supplement. And since Vitamin D pairs up nicely with calcium, helping your body absorb what it needs (as my mom pointed out), I probably should be taking that too. Then there’s the fact that I feel like my brain is a useless puddle of Swiss cheese. When the anemia was really severe, my short term memory took a hit. I still feel a bit like I’m climbing out of a pit, and I figure my body needs all the help I can give it. My mom has been suggesting that I start taking fish oil, since that’s supposed to help with “brain health” and “cognitive function”. My feelings on this fall somewhere between “it can’t hurt” and “she’s probably right”. 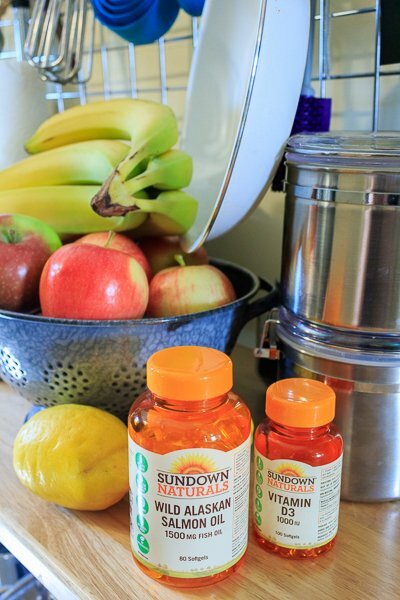 Sundown Naturals® is a well established brand of vitamins and supplements, which is newly available in Canada. The big thing here is what these vitamins don’t have. All of their products are non-GMO (and they’re the first broad line vitamin sold in pharmacies that is 100% non-GMO). They contain no artificial colours or flavours. They have no preservatives. They are free of gluten and wheat, and they have no dairy or lactose in them. 100% free of the stuff you don’t want, 100% of the time. I had never considered vitamins as being something that might have gluten in them. Now, a product being gluten free isn’t a big deal for me, personally. However, for my mom and others like her, gluten free is critical. My mom was diagnosed with Celiac Sprue when I was a wee kid. So, I grew up in a household where gluten free products were the norm. And even now, a couple of decades later, gluten free products are always on my radar. With going gluten free becoming trendier in the past decade, I have noticed some really odd products being labelled as gluten free. Things that to the best of my knowledge should never contain gluten. I get it; cross contamination is an issue. But I still cringe every time I run into things like guacamole, eggs, coffee, or butter that are labelled gluten free. My mom and my sister and I usually have a good laugh about it. Now here’s where things get interesting. It turns out that my mom has never looked at her vitamins to see if they contained gluten, and it just so happens that there can be gluten in vitamins. Given that my mom has been living with Celiac Disease for over thirty years it was pretty shocking to discover that there was a source of gluten that she wasn’t aware of. So that’s the story of how I ended up teaching my mom a new thing she needs to watch out for when shopping, and also completely sold her on Sundown Naturals® as her first choice in vitamins. This was supposed to be all about my mom taking care of me, and helping encourage me to take supplements, and it ended up being about me helping to take care of her. Weird how things can go, eh? Check out the Sundown Naturals® website for further information on which of their products are available in Canada and where you can buy them. Disclosure: This post was sponsored by Sundown Naturals®. As always my words and opinions are my own. I have chronic anemia treated with iron supplements too. Having an autoimmune disease where I should avoid gluten AND soy, I too have found its important to read ingredients lists for everything. I also have found taking my supplements is a crazy making, juggling exercise – my Iron should be taken with Vit C but on an empty stomach and not when I take my thyroid meds. Then my Omega 3 should be taken with Vit D and with food. Instead of Calcium I should be increasing my Magnesium, Selenium and B12…………….oh it gets exhausting lol! Ha. Yes, exactly that! Juggling what to take when and what to pair with which IS crazy. 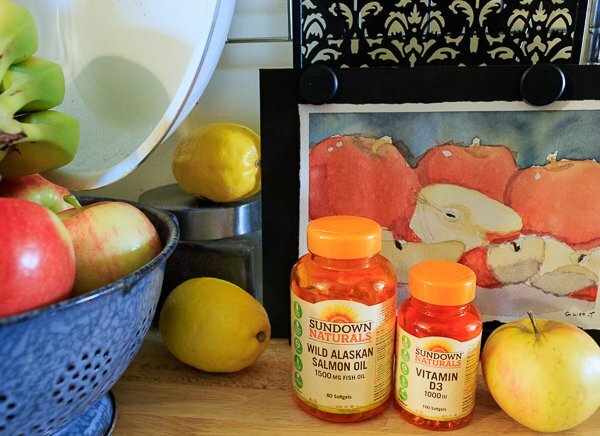 So awesome that Sundown Naturals are gluten free, and that you were able to help your mom find a better vitamin solution! I’ll have to find them next time I’m picking up Vit Ds and B12s! Thanks for the heads up! Who knew?! It seems like Gluten can be in just about everything! Glad you found one that works for you, and thanks for letting us know that we need to watch for it, even in vitamins! It was a surprise for me. I figure after spending over thirty years having a close family member with Celiac’s Disease, that I was pretty well educated on all things gluten/gluten free. Guess there’s always more to learn, eh? These sounds great! I have severe anemia and celiac Disease! I love how these vitamins are Gluten Free!! Ill have to try it! I’m sure glad I don’t have to worry about gluten! But I have to watch my iron intake as my body does not get rid of excess Iron. I don’t avoid all iron food as their is so much nutrient in these food, but I avoid anything over 20%. Thank you, I will check out Sundown vitamins as I soon need to purchase some. I take Vitamin D daily summer and winter. I have not heard of Sundown before. I will check more into them. I haven’t seen this in stores before. My family does take vitamins daily though. My goodness I never thought that vitamins could contain gluten. My daughter has a intolerance to gluten, and allergic to dairy. Thanks very much for this helpful information on Sundown Naturals vitamins, I’m going to forward it to her. This is something I just learned from you too.Wow! This is good to know and I will be checking out Sundown Naturals. I love how these vitamins are Gluten Free -I will have to try them. Great information – thank you. I knew less than I thought, lol. Vitamin D is my most important vitamin.. If nothing else, I take that. A very informative post. I never thought vitamins could contain gluten as well! I usually just grab whatever is on sale, but I am definitely going to pay attention to that now. I might have to give Sundown naturals a try. 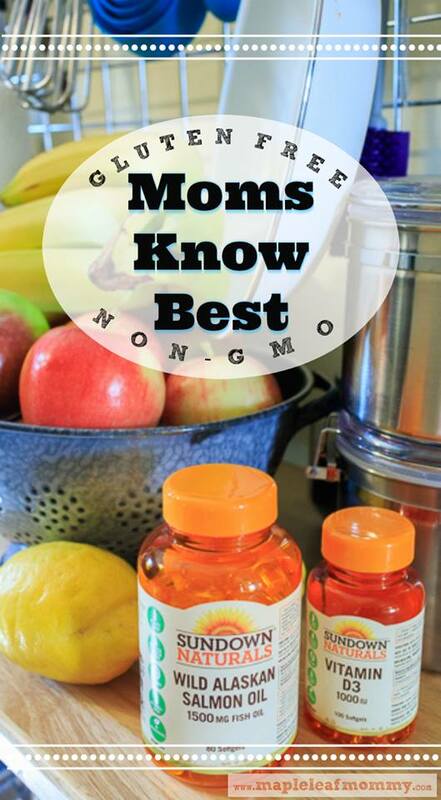 I’m so glad to hear that you were able to introduce these gluten-free vitamins to your mom! I’ll have to try these vitamins too – i don’t have a gluten intolerance but this brand sounds like it’s just an awesome brand in general! I’m not anemic but I know someone who is, and we all appreciate more natural everything. I’ll check out the brand. I know this post was from two years ago, but I just came across your blog (looking at the list of French shows available on Netflix). Did you know you can get DHA from non-fish sources? That way you can avoid all the toxins found in fish. They are called vegan or algae-based DHA supplements. Oh cool, Sabrina. No, I did not know that. Definitely something to look into.